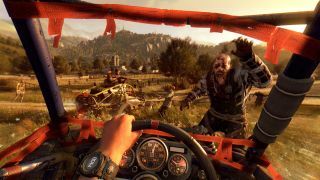 Following on from the pre-announcement of the new Dying Light DLC The Following, Techland has released a trailer that provides a look at the new area. Apparently it's as big as Dying Light's original maps combined, and includes an upgradeable buggy that mulches zombies real good. This is a story-based expansion that promises to tell "the untold chapter of Kyle Crane's story". In it, Crane heads to the outback and has to gain the trust of some local cultists. There's no European pricing yet, but it costs $14.99 in the US and is included for as part of the Dying Light Season pass. We also don't have a release date, but it was playable at Gamescom so it shouldn't be too long. Not played Dying Light? Check out our review to see if it's your kind of thing.